Big-name celebrities have a lot of money, and with this substantial wealth comes big houses and often many cars. Some celebrities have become just as well-known for their out-of-this-world car collections as they are for their personas. Other celebrities fly, or rather ride under the radar and feed their obsessions out of the public eye. But whether they are there to flaunt their fleet of cars or add to their personal collection privately, here are a few celebrities with the craziest and largest car collections. 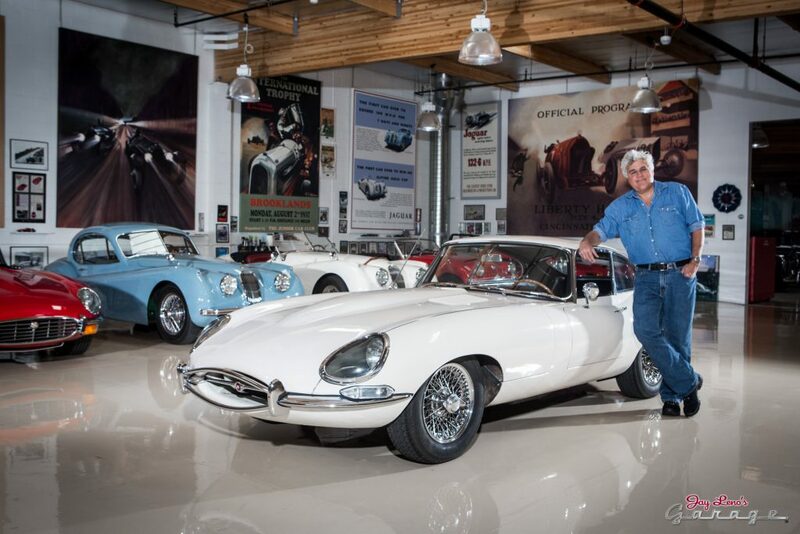 Comedian Jay Leno, known by many as Johnny Carson’s successor to the Tonight Show, is possibly the most famous car collector on earth and is just as famous for his record-breaking car collecting passion (perhaps addiction), as for his stand-up comedy and talk show hosting. Jay Leno’s car collection is incredibly dynamic so he is constantly adding, trading or modifying cars and motorcycles, but he is currently rumored to have over 200-cars and over 100-motorcycles. Leno’s car collection is diverse in terms of age, price, rarity, engine configuration, brand, etc. For instance he has a 1906 Stanley Steamer but also a brand new McLaren MP4-12C super car. Jay Leno is respected as a true car guy that procures cars (albeit expensive ones) simply because he loves automobiles as opposed to collecting high-end cars as a status symbol. Within his massive warehouse garage he even has special equipment for working on the vehicles. Better known for his trademark clothes worn daily by people all over the world, Ralph Lauren also has quite the well-tailored collection of high-end vehicles. Lauren has been said to view each vehicle of his as a piece art instead of a vehicle, and you’d have to agree with him on most of cars in his personal collection. Lauren’s collection of cars include the Jaguar XK 120, Alfa Romeo 8C 2300 Monza, Alfa Romeo 8C 2900 mille Miglia, Ferrari 250 LM, Mercedes-Benz 300SL, and so many other beautiful trendsetting showpieces. Ralph Lauren has done our future a huge favor by keeping such amazing cars alive today and for generations to come. One of the funniest comedians and actors of our time also collects some of the best cars of his time. His particular taste is geard towards Porsche. Jerry Seinfeld collects mostly Porsches supposedly because of his infinite love of the body styling that comes from the German engineering behind every curve and scope present on the road monsters. In fact it has been made known that the number of Porsche vehicles he owns is only rivaled by that of the actual Porsche museum. Among his fast fleet, Jerry owns some of the most sought after and prestigious Porsches such as: Porsche 959, Porsche 964, 1944 Porsche 550 spyder, Porsche Carrera GT, and many other Porsches that he has kept under wraps for years. His entire collection has been valued at around $15 million dollars. Funnyman and former-sitcom star Tim Allen (Home Improvement, The Santa Claus) has told interviewers that he has purchased every car he ever had a toy model of as a child. Allen readily admits he has more cars than he needs, but that doesn’t stop him from sharing his love of these four-wheeled works of art in interviews. His personal collection includes a variety of custom-built classics from over the decades. Boxer Floyd Mayweather, Jr.’s nickname is “Money” for a good reason. He’s practically made of cash. According to Forbes, the flamboyant boxing legend made more than $105 million in 2014 and Over $180 million from his last match with Manny Pacquiao. And he really loves to show off spend it! The total value of Mayweather’s exotic car collection is roughly $5.94 million, which may not make him a rival for Seinfeld or Leno. For a guy with an estimated net worth of more than $280 million, this is a drop in the bucket. After all, we’re talking about the same guy who reportedly keeps $123 million in a single bank account. However his fleet includes multiple copies of expensive cars and even private planes. Say what you will about his ring persona or his personal life, he definitely seems to be a guy who enjoys having nice things around. At the end of the day, driving a different Bugatti seems like crazy levels of decadent, but you can’t help but wonder what that might be like. So there you have it, 5 of the most famous or infamous celebrity car collections. Stay tuned for more glimpses into the garages (sometimes warehouses) of some of our most rich and famous as we will continue this series and give you gearheads a look into some of the most desirable car collections in the world.